For so many years, I told myself that I didn’t have time to really dig into the scriptures in any kind of way. No time or space for Bible journaling. No brain power to memorize verses (thanks, motherhood!). I definitely do not have the patience for color coding my Bible reading. And forget scripture writing—who has time for that?! All of these methods sounded so amazing! So many creative ways to honor God—the thought of that always sounded so nice. But in reality, these things became just another thing on my to-do list. Another thing I wasn’t getting done. Another thing for me to fail at. At certain points in my life, I have been able to spend hours absorbing God’s Word. Reading, writing, studying—I could do it all. But then there have been seasons when I am in survival mode. Sick kids, crazy work schedule, family obligations, sports, depression, anxiety…..all of these things. It is in these not-so-fun times when I need something simple that can get me right to the heart of what God wants me to hear. It’s easy, effective, and keeps you deeply rooted in God’s Word. Spend time decorating the page and being creative, or don’t—there is no right or wrong way to do this. Just commit 5 or so minutes a day to looking up the short scripture and writing it on the block calendar. Open with a simple prayer–asking the Lord to bless your time, no matter how brief. Look up and read the corresponding scripture with day you’re on, using the 31-day Deeply Rooted Scripture Guide provided in the download. Write all or some of the scripture in the corresponding block. That’s it! It may seem like this isn’t enough. I get that, but that is a lie from the enemy. God’s Word, no matter how simple—NEVER RETURNS VOID. 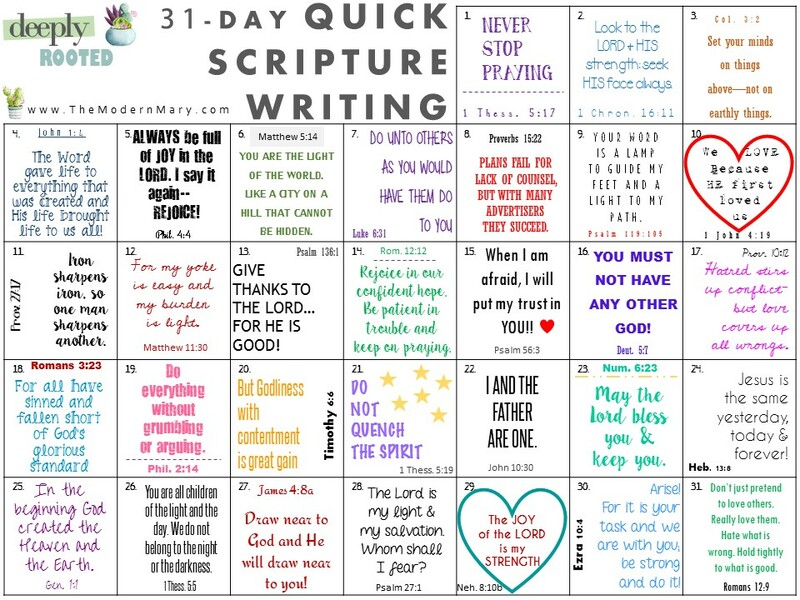 Sign up below to receive this free Quick Scripture Writing Block Calendar to your inbox right away!! Drop your email below, and get your free printable delivered to your inbox within the next few minutes! Yes! I want to receive this freebie and future updates as well!